Long red handles with black ends. English/American sizes No. 1 to No. 12 as well as sizes 16, 20, 24 and 30. Filbert and Fresco shape for painting on wet, plastered surfaces and for mural painting on dry stucco. 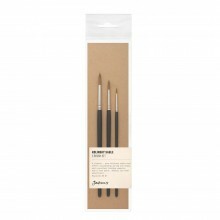 The bristle brush series in filbert shape, is made of bristles which are worked deeply into the ferrule. 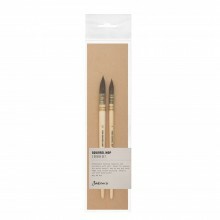 Only through such bristle length can the positive and enduring effect of the interlock production come fully into its own, which is crucial for the elasticity, springiness and longevity of this bristle artist brush.